New Understanding of Religion: One of the most significant contributions of Swami Vivekananda to the modern world is his interpretation of religion as a universal experience of transcendent Reality, common to all humanity. Swamiji met the challenge of modern science by showing that religion is as scientific as science itself; religion is the ‘science of consciousness’. As such, religion and science are not contradictory to each other but are complementary. View of Man: Vivekananda’s concept of ‘potential divinity of the soul’ gives a new, ennobling concept of man. The present age is the age of humanism which holds that man should be the chief concern and centre of all activities and thinking. Through science and technology man has attained great prosperity and power, and modern methods of communication and travel have converted human society into a ‘global village’. But the degradation of man has also been going on apace, as witnessed by the enormous increase in broken homes, immorality, violence, crime, etc. in modern society. Vivekananda’s concept of potential divinity of the soul prevents this degradation, divinizes human relationships, and makes life meaningful and worth living. Swamiji has laid the foundation for ‘spiritual humanism’, which is manifesting itself through several neo-humanistic movements and the current interest in meditation, Zen etc all over the world. Bridge between the East and the West: Another great contribution of Swami Vivekananda was to build a bridge between Indian culture and Western culture. He did it by interpreting Hindu scriptures and philosophy and the Hindu way of life and institutions to the Western people in an idiom which they could understand. He made the Western people realize that they had to learn much from Indian spirituality for their own well-being. He showed that, in spite of her poverty and backwardness, India had a great contribution to make to world culture. In this way he was instrumental in ending India’s cultural isolation from the rest of the world. He was India’s first great cultural ambassador to the West. Swamiji gave Indians proper understanding of their country’s great spiritual heritage and thus gave them pride in their past. Furthermore, he pointed out to Indians the drawbacks of Western culture and the need for India’s contribution to overcome these drawbacks. In this way Swamiji made India a nation with a global mission. Defence: Another important service rendered by Swamiji was to raise his voice in defence of Hinduism. In fact, this was one of the main types of work he did in the West. Christian missionary propaganda had given a wrong understanding of Hinduism and India in Western minds. Swamiji had to face a lot of opposition in his attempts to defend Hinduism. Meeting the Challenges: At the end of the 19th century, India in general, and Hinduism in particular, faced grave challenges from Western materialistic life, the ideas of Western free society, and the proselytizing activities of Christians. Vivekananda met these challenges by integrating the best elements of Western culture in Hindu culture. 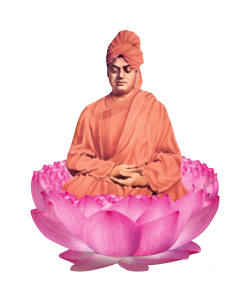 New Ideal of Monasticism: A major contribution of Vivekananda to Hinduism is the rejuvenation and modernization of monasticism. In this new monastic ideal, followed in the Ramakrishna Order, the ancient principles of renunciation and God realization are combined with service to God in man (Shiva jnane jiva seva). Vivekananda elevated social service to the status of divine service. Refurbishing of Hindu Philosophy and Religious Doctrines: Vivekananda did not merely interpret ancient Hindu scriptures and philosophical ideas in terms of modern thought. He also added several illuminating original concepts based on his own transcendental experiences and vision of the future. This, however, needs a detailed study of Hindu philosophy which cannot be attempted here. Romain Rolland, The Life of Vivekananda, tr. E.K. Malcolm Smith. Kolkata: Advaita Ashrama. Please Click the link for Further Details:http://www.belurmath.org/swamivivekananda.htm.